Today I’m attempting to refute a myth that has been circulating about Quick Lubes and how we do business. We quick lube owners and employees have been accused of recommending “unneeded” oil changes just to make more money. That may be true at some quick lubes, but when we service your car, we only suggest services that we believe are necessary to keep your car running at its best. 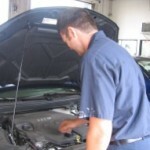 Let me explain why we recommend an oil change every 3,000 miles or every three months. In recent years, many vehicle manufacturers have extended their recommended oil change intervals to try to help reduce the cost of maintenance for car owners, but have run into trouble. The Center for Auto Safety has gotten thousands of complaints from motorists who thought they were following the correct service intervals in their owners manuals but ended up with a crankcase full of sludge. Motor oil does more than lubricate the engine. It also forms a film on surfaces that separates moving parts so they don’t rub against one another so friction and wear is reduced. Oil also serves as a coolant for critical engine parts like the crankshaft and valve train. It also helps to prevent rust and corrosion inside the engine, and keeps surfaces clean by dissolving and carrying away dirt and deposits. Oil life depends on many factors; driving conditions, temperature, humidity, airborne dirt, and engine wear. Extended oil change intervals of 7,500 or 10,000 miles are based on ideal operating conditions, not stop and go driving, or driving our cars for several short trips, like most drivers do each day. So most drivers should follow a “severe” service schedule rather than a “normal” schedule to protect their engines. Most experts still consider a 3,000 miles or six month oil change for “severe” drivers. We have also heard the argument at our quick lube that since motor oils are of higher quality than they once were, we don’t need to change our oil as often. Yes, motor oils are better than they once were, but oil filters have not kept up. An engines main line of defense against abrasion and the wear it causes is the oil filter. The oil filter’s job is to remove solid contaminants like dirt, carbon, and metal particles from the oil before they can damage surfaces in the engine. If your oil filter is clogged, it can’t do its job and unfiltered oil is allowed to enter the engine. Contaminants that find their way into the crankcase will be pumped through the engine and accelerate wear. Although motor oils have been improved and are continuing to be improved, there has been little done to improve oil filters. The majority of oil filters still need to be replaced every 3,000 miles. So until the oil filters are equal in their quality to the motor oils, we will continue to recommend a 3,000 mile or three month oil change at our quick lube.